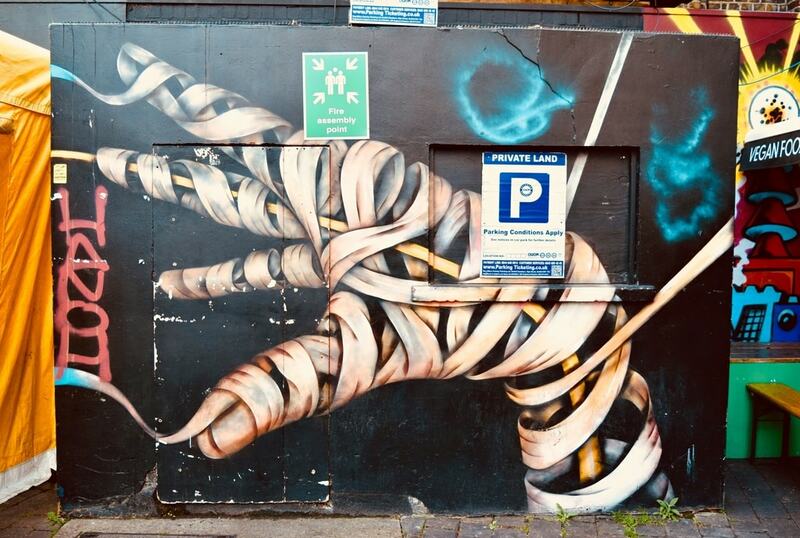 Brixton is a South London district famous for bustling markets, Electric Avenue, the Ritzy Picturehouse and a wonderful labyrinth of street art. The urban walls not only represent local heritage, but also various music genres, flashes of history and even the protests that have taken place there. Here is a guide to some of the unique creations in the area. There’s a Starman waiting on the side of Morley’s department store as a huge, iconic David Bowie mural pays homage the late local resident. 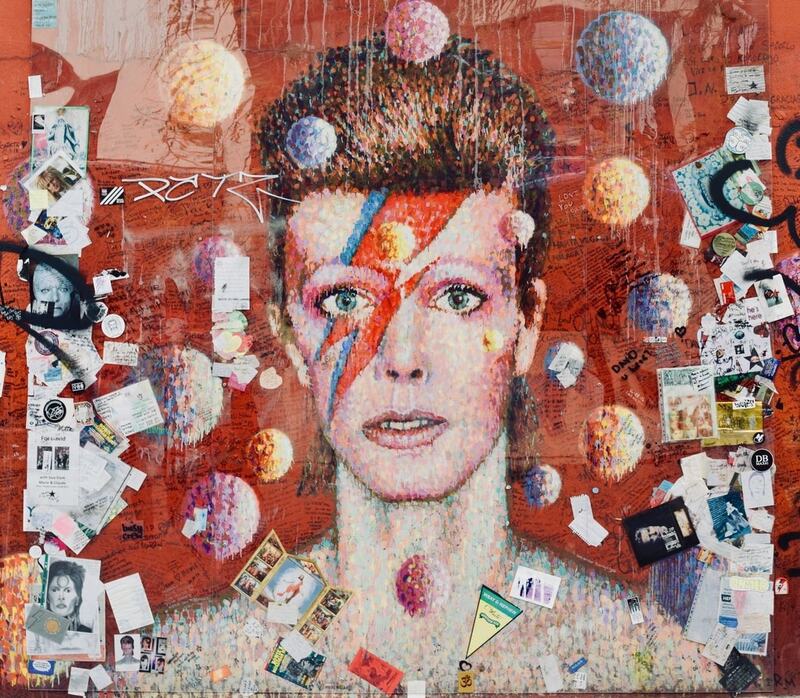 Created in 2013 by Australian street artist James Cochran, the graffiti has become a popular memorial to Bowie after his death in January 2016. Mirroring the portrait of his 1973 album Aladdin Sane, the piece it is now preserved by plastic to protect it from the elements. 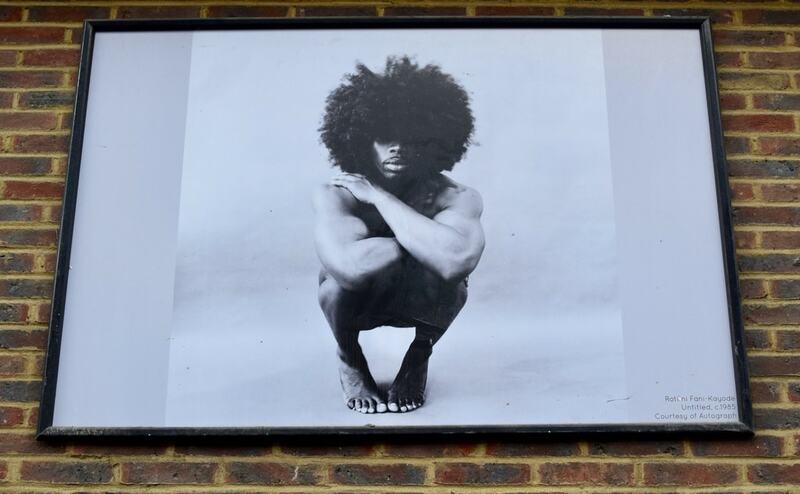 Mounted high up on a wall is this black and white photograph by Rotimi Fani-Kayode, whose work aimed to explore the black male body, examining sexuality and European and African cultures, migration and belonging. Born in Lagos, Nigeria, in 1955, Fani-Kayode died in 1989 in Brixton – just three years after this photo was created. 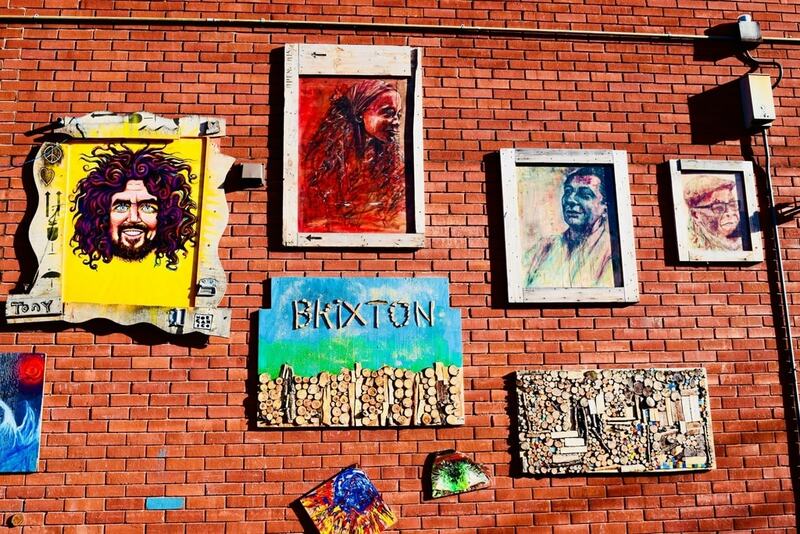 Adjacent to Brixton Station Road Market stands a series of dynamic portraits, sculptures and pictures accompanied by a silver plaque that states: ‘The people were vibrant, the music was vibrant, they dressed vibrant #HandsofBrixton.’ The visionary illustrations strongly represent the local community, and offer a unique gallery-style experience. Hip-hop themed fish eatery, Chip Shop Bxtn, has covered its exterior shutters and walls with painted faces of musicians including 2Pac, Big L and The Notorious B.I.G. 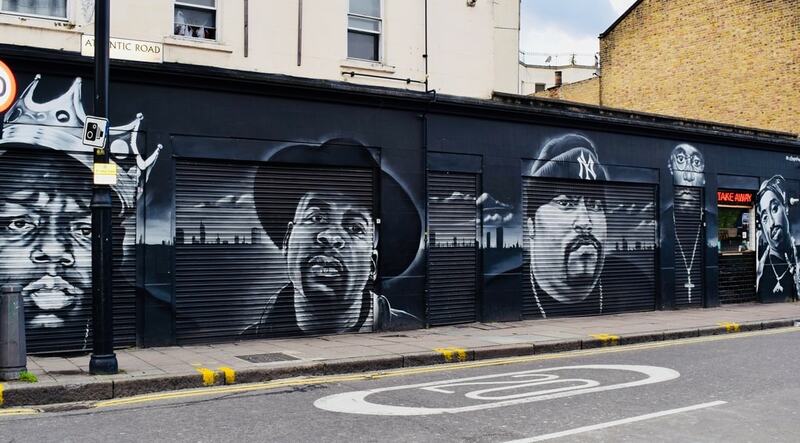 Spreading along Atlantic Road and round the corner to Coldharbour Lane, the exhaustive artwork offers an English tribute to the old-skool American rappers. Next to a sparkling vegan food outlet appears a huge, semi-creepy, unravelling hand greeting visitors to the entrance of Brixton Village and Market Row. With intricate detail and minimal colour, the vivid piece is an artistic talking point in the small area. Peeping just off the famous avenue (it was the first market street to be lit by electricity) stands a vivacious blue elephant. 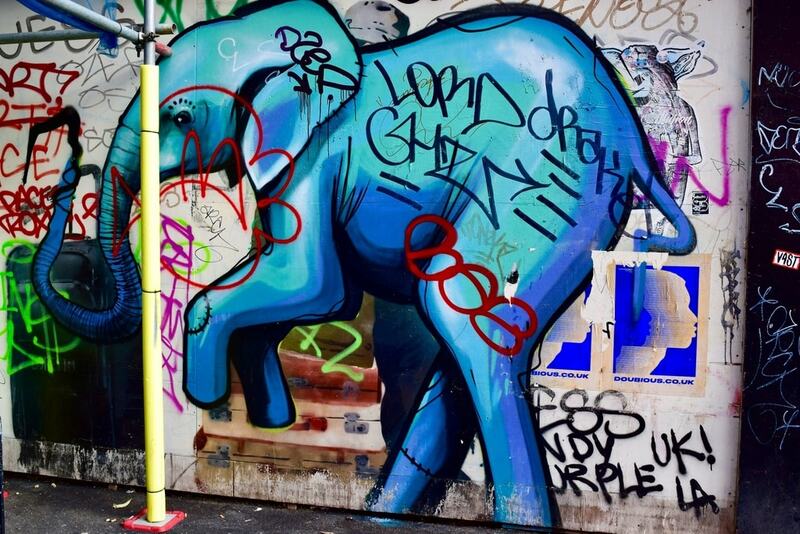 Although now partially covered with other graffiti tags, the detail and colours used are so bold and fresh that animal is an absolute joy to walk past. Among the hustle and bustle of the market stands a striking black and white portrait of a smiley Bob Marley on a bright background. Gracing the shutters of food kiosk Bush Man Kitchen, the image is autographed by local graffiti artist Dope. 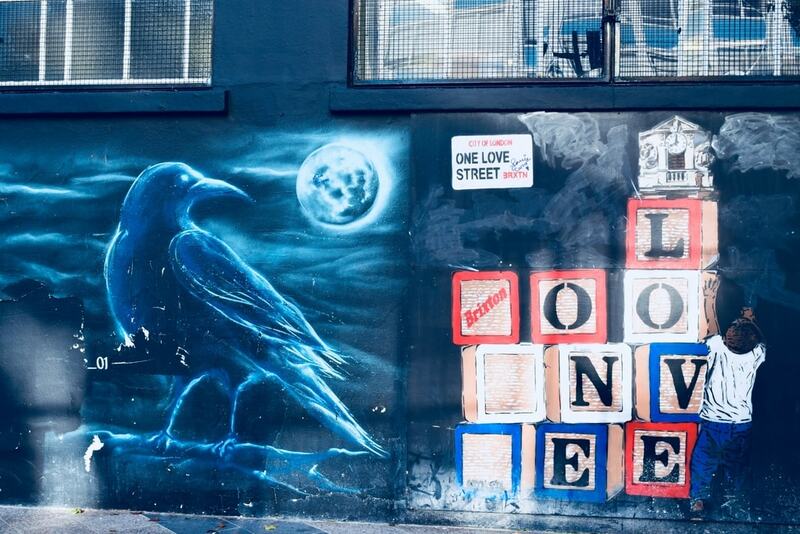 Charming images appear along the pedestrian walkway entitled ‘One Love Street’ by artist Unify, featuring a girl holding a heart-shaped balloon and a boy reaching for a little clock on top of wooden bricks. Other urban art pieces appear under the Brixton Street Gallery, including a garishly conspicuous bird accompanied by a written passage. Paste-ups are aplenty in the area, with the small forms of street art popping up all around town. 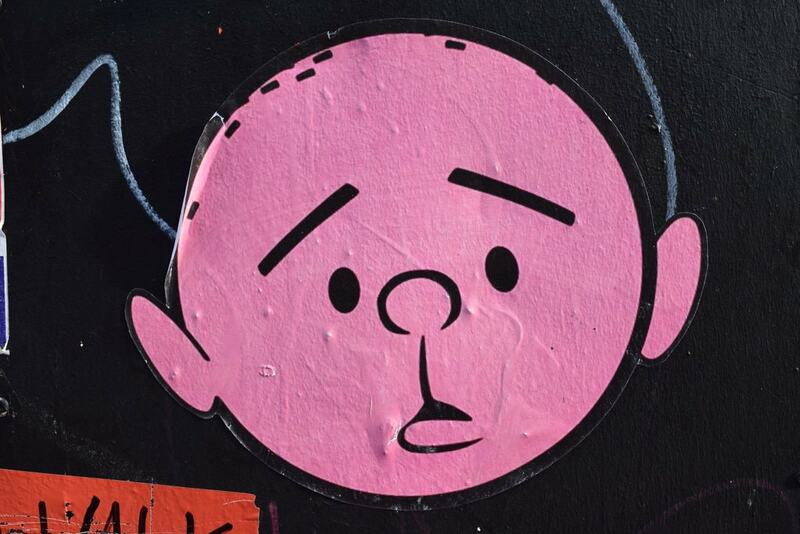 This bright, peculiar face (could it be Karl Pilkington?) appears on the Coldhabour Lane side of Electric Lane hiding low on a brick wall. Stop the Evictions is a local protest from independent traders under the arches of Brixton Station. The traders are protesting against the rent increases and threat of ejection. 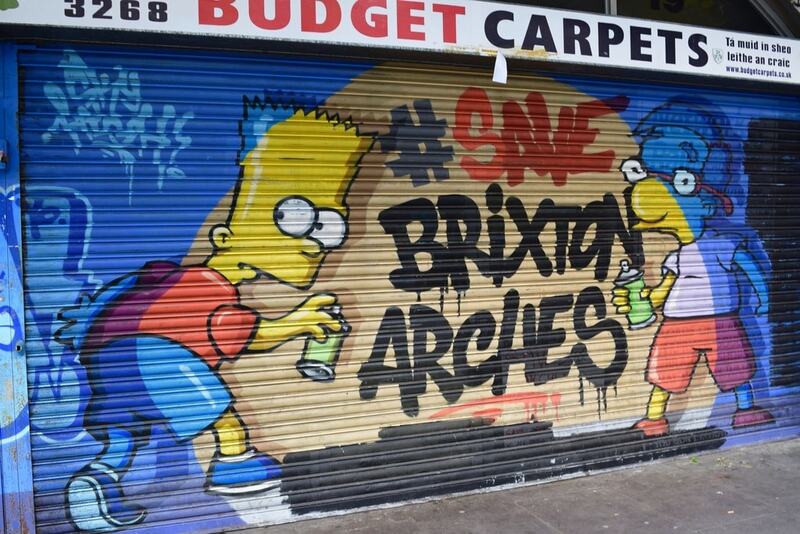 To portray defiance and oppose gentrification, there is a gallery of graffiti, featuring everything from a cheeky Bart Simpson to a poignant portrait of a young child shouting, and more. 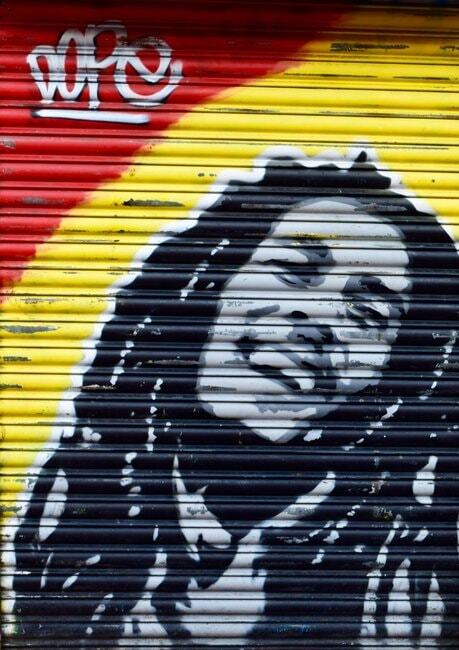 The emotive street art represents local urban talent and can be seen on various shop fronts along the street.